As soon as I saw that first sentence I thought Alice Cooper! Actually my first thought was "no it's not, in England we don't break up until the third week in July" but then I thought Alice Cooper! I found a great monochrome design of his face but it was for beading and didn't translate directly to stitching. I'd have to rechart it to get the dimensions right, he came out very long and thin so I abandoned that idea. I did consider buying this one from PixelPower but I'd left it rather late in the month. So what did I stitch this month that could possibly fit into the theme? The rest of my stitching consisted of an Autumn Fairy, some Hallowe'en Countdown pieces, three different Winter projects and the Bride of Frankenstein's Monster. What I was looking for was a small dragon on a pile of books but googling around didn't come up with anything. Then I found a dragon reading a book on DeviantArt. The dragon looked familiar, and lo and behold the stitcher revealed it was a Teresa Wentzler freebie, amended to be holding a book instead of an orb. Futurecast was designed for stitchers to choose their own colour scheme and Teresa has given great instructions on how to do so. 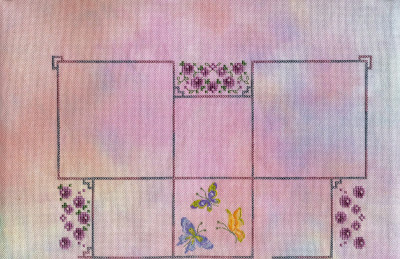 She also has a Gallery of finished designs so you can use their schemes if you want. The school colours are green and yellow, there was a lovely dragon there in those exact colours so that is the one I went with. I won't be stitching the border because I want to add the teacher's name and the school's name and year. Finally the Summer Postcard Blog Hop (which fits in nicely with the Theme) is now underway. The second postcard went to Jocondine and her eponymous blog. Follow the link to see her card, message and who sent it to her. There is still time to join in with the Blog Hop, just click on the garden picture on the right hand side bar to find out more details. 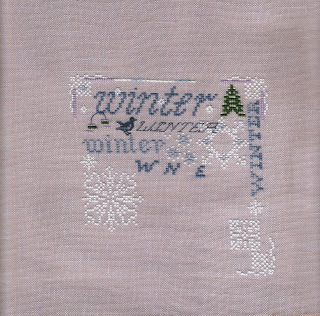 Once again I have been stitching on Winter Typography. 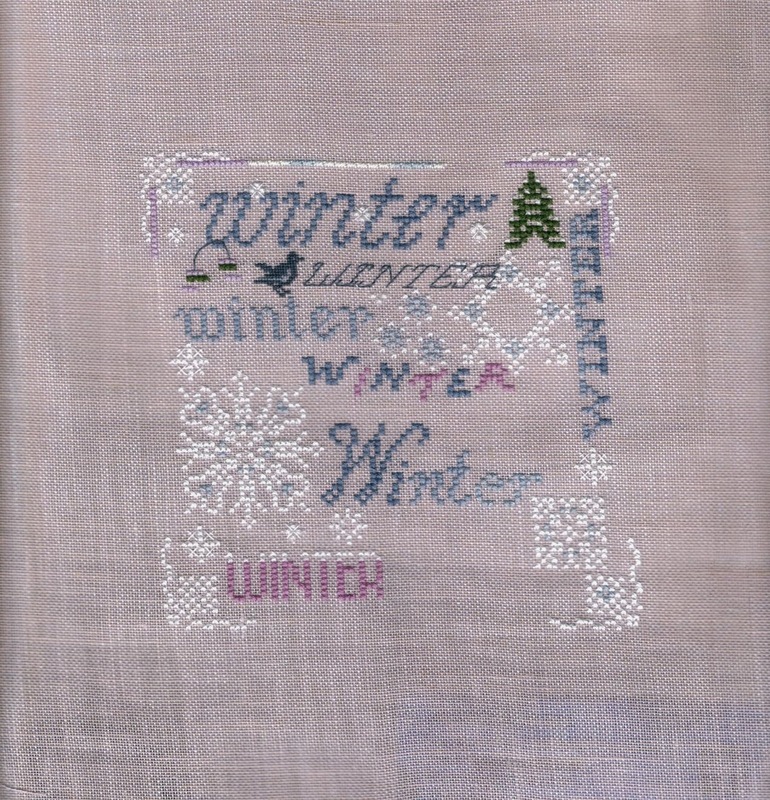 I toyed with the idea of stitching a small instead but really want to finish this one this year! It is taking so much longer than the Autumn one did. No idea why. 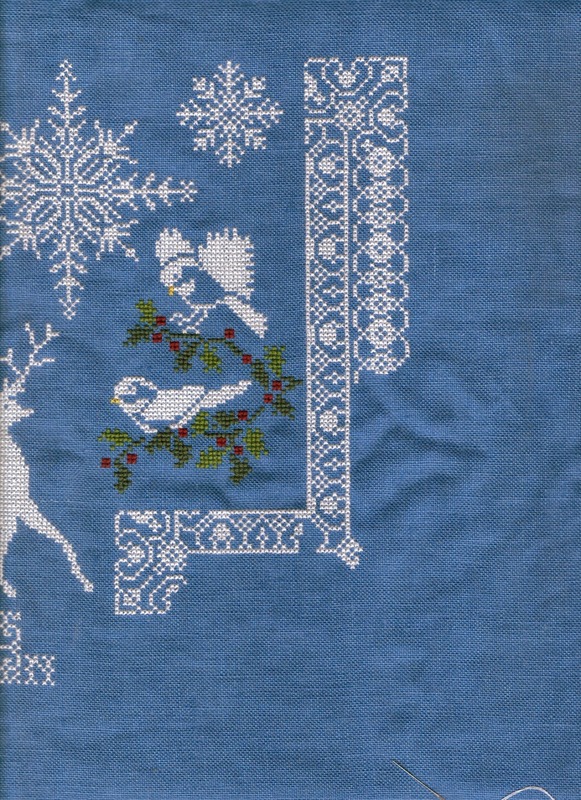 I stitched quite alot more white, two WINTERS and filled in some of the pale blue stitches in the white snowflakes. They look really nice in real life. 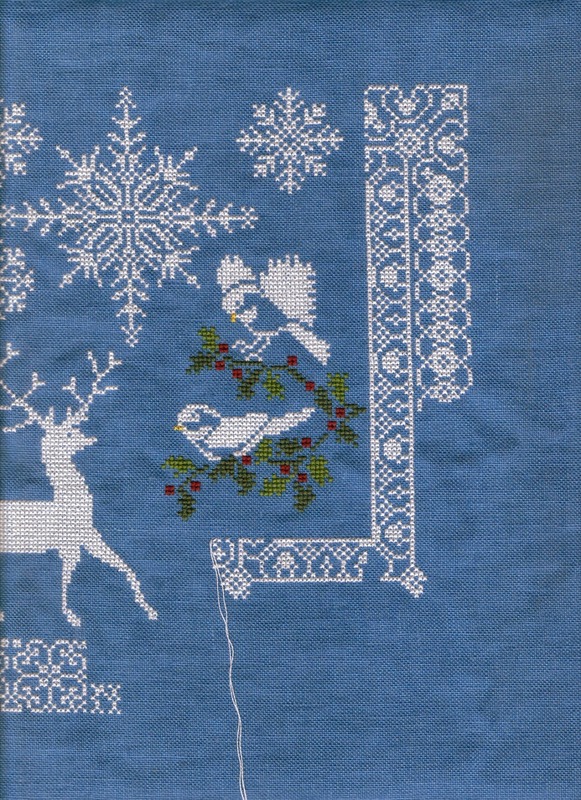 There is a rabbit, a bird, a snowman, some more WINTERS and alot more border to do before I start on the beads. The second postcard in the Summer Blog Hop went out today. So watch out for that appearing in your Readers and Dashboards soon. Once the recipient posts it to her blog I will put the link up. Don't forget there is still plenty of time to join in. Finally, Chiara the Grey Tail hosted her second Enigma challenge recently. She has been posting a series of clues to a piece she is stitching. Very enigmatic clues which have foxed everyone except Heather who had the inspired correct guess after just one clue. Anyway Chiara reveals the answer today. If you haven't been following the Enigma you should start with this post and work forward to see how long it take you to work it out! Can you see the big blob of white from the Noel Blanc frogs? Now I would usually post something on the Theme of the Day but I'm not a great cook or a fan of recipes and so on. I thought instead we would have a Feast for your Eyes, much more suitable for a stitching blog. Back in February Gwen of Guava Gems left the 5000th comment on my blog. I wanted to send something suitable so I read through her blog and saw she was taking part in the Snooty Parrots SAL. 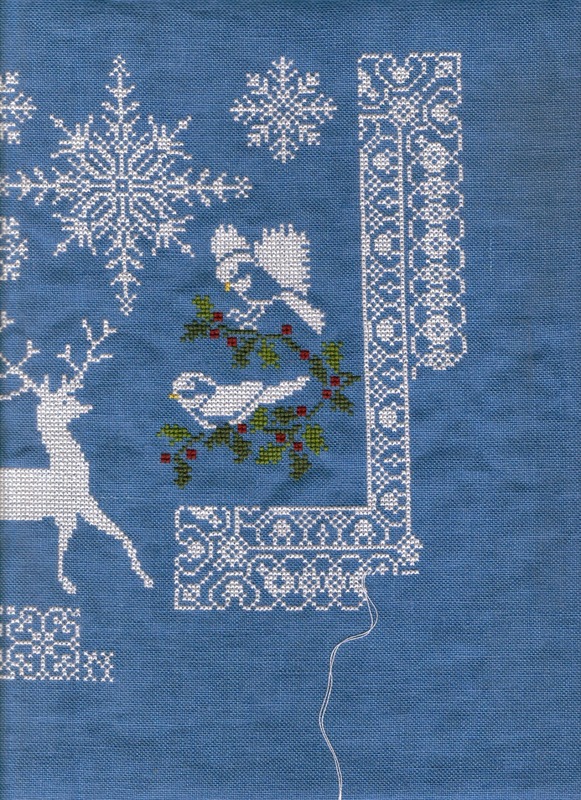 I had this little parrot bookmark in my stash, a cover kit from Cross Stitcher magazine. I used their colours but changed the parrots around a little to make them more colourful. In the parcel I included a piece of this fabric, I couldn't find any with parrots on but this is very colourful. 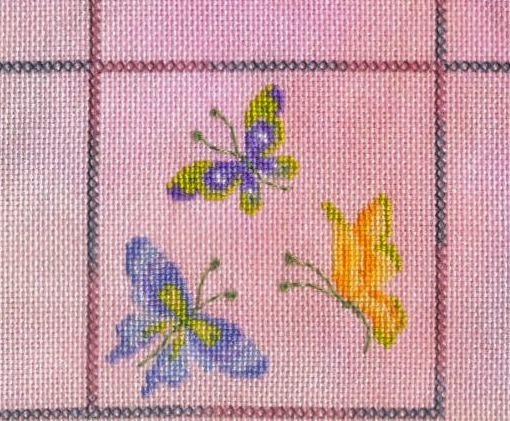 I also included a skein of Jodyri's Over The Rainbow thread which includes the same colours as the parrots and a Lucie Heaton booklet of Summer Stitching. And my karmic reward for sending out three giveaways? One in return! I've been following Annette the California Stitcher for a while and through her blog I found Lee from Notes from Under the Mountain. I became a follower and left some comments. The next thing I know, Lee has chosen me to receive a gift in her Fifth Anniversary Giveaway!! Lee gives some great instructions on how to make one of these for yourself on her other blog Other Side of the Mountain. As I mentioned Lee lives in New Zealand so when she asked for my address I was quite apologetic and said I am in England (postage being what it is) and gave the village and nearest town. To both our surprise, Lee knows the area because her Great Grandfather grew up around here! Just a few miles down the road. She asked me about a place she'd had problems finding and I was able to send her some links and some information. How much of a co-incidence is that? Finally, if you have already signed up for the Summer Postcard Blog Hop don't forget to send your photos in as soon as possible. And if you haven't signed up then please do so! 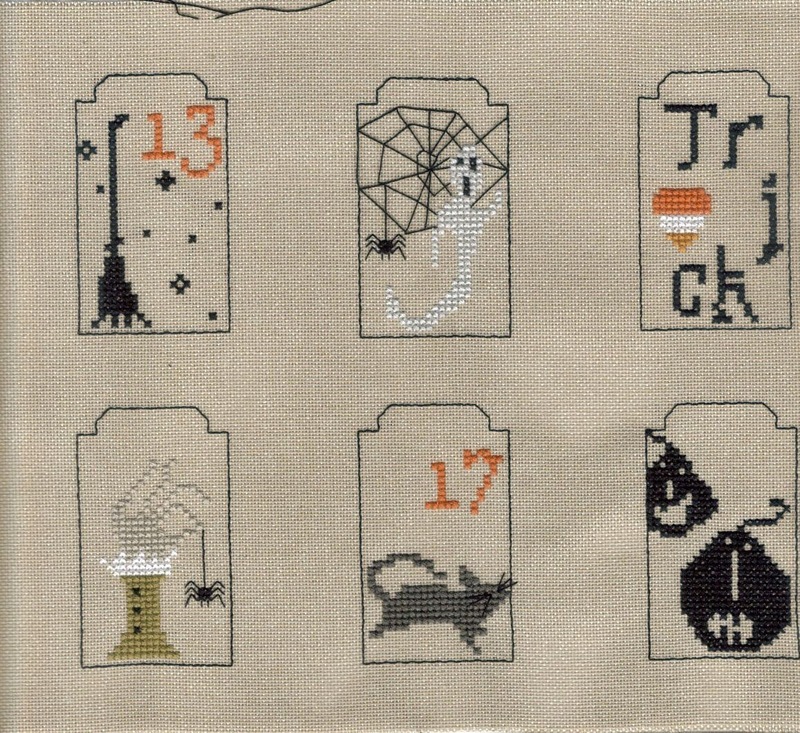 The theme for June's Hallowe'en stitch is "Any Freebie Chart". I thought it would be nice for everyone to have a nice open choice for one month. And a chance to share some of the great freebies the designers give us. There is a whole page of links to freebie charts on the blog so if you love your Spooky Stitching, why not pop over and look up a few? I haven't quite finished this month's design. Can you guess what it is? Is that steam coming out of her head? Maybe not LOL. Those of you familiar with the Spooky Countdown may have noticed that I have changed Block 21 completely. The charted block is a decorative border for the word “OR” as in “Trick or Treat”. 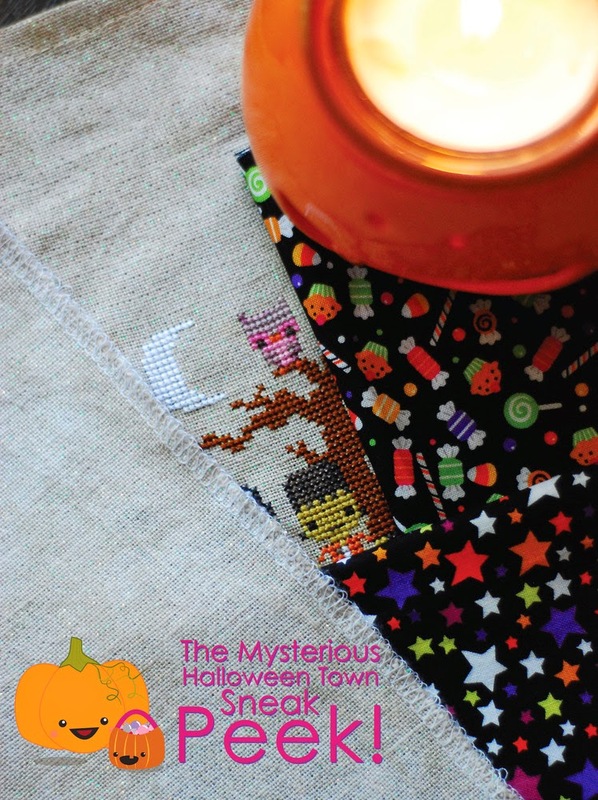 If you stitch the piece as a sampler then it fits vertically between the blocks that say “Trick” and “Treat”. But as I am using the blocks for my Countdown Calendar this would not have the same effect. Block 4 commemorated the famous Salem Witch Trials of 1692. I am sure that most of my followers will be aware of these trials and the innocent women put to death as witches. But how many of you have heard of the Witch Trials which set the legal precedent for those in Salem? How many of you know the names Rose Cullender and Amy Denny? In 1660, those two elderly widows were living in Lowestoft in Suffolk, England, a mere mile or so from where I was born, bred and am still living. They were accused of witchcraft by a number of local residents, tried by the eminent Sir Matthew Hale and sentenced to death by hanging in 1662. Some twenty years later a pamphlet was produced “A Tryal of Witches”, it was the evidence given in this pamphlet that persuaded the courts in Salem that “spectral evidence” was valid in a court of law and the Salem Witches began. There are links to the various people, photos of their homes and their gravestones. One of the most interesting links for me is that of Samuel Pacy http://www.lowestoftwitches.com/samuel%20pacy.htm there is a great photo of his house today on this page. It is very well-known to me as it is now a wool shop which also sells DMC to me! Samuel Pacy’s daughter Elizabeth was one of the “victims” of the witches and an important witness in the trial. He also had an older brother Nicholas, who had recently emigrated. To the town of Salem, Massachusetts. If you are at all interested in history and witches, particularly the witch trials I can really recommend spending some time on the website following the various links. Here are two more smalls I finished last month but couldn't show. The full story will follow soon, there is still one gift making slow progress across the ocean! Finally, the Summer Postcard Blog Hop has started! The first postcard went to Gracie of Needles, Pins and Dragonflies. Follow the link to see her card, message and who sent it to her. There is still time to join in with the Blog Hop, just click on the garden picture on the right hand side bar to find out more details. So I spent quite alot this month without having very much to show for it! Crafty Kitten do a layaway scheme where you ask Dawn to put things aside for you and then you pay into your account until everything is paid for and she mails it out to you. I'm saving up for the JCS DVD 1991-2000, the Hallowe'en ornie issue and the 16 new DMC thread packs. I also want some fabric for the Frosted Pumpkin SAL. I sold a whole batch of duplicate Anchor threads I had inherited and put the whole proceeds onto my CK account. 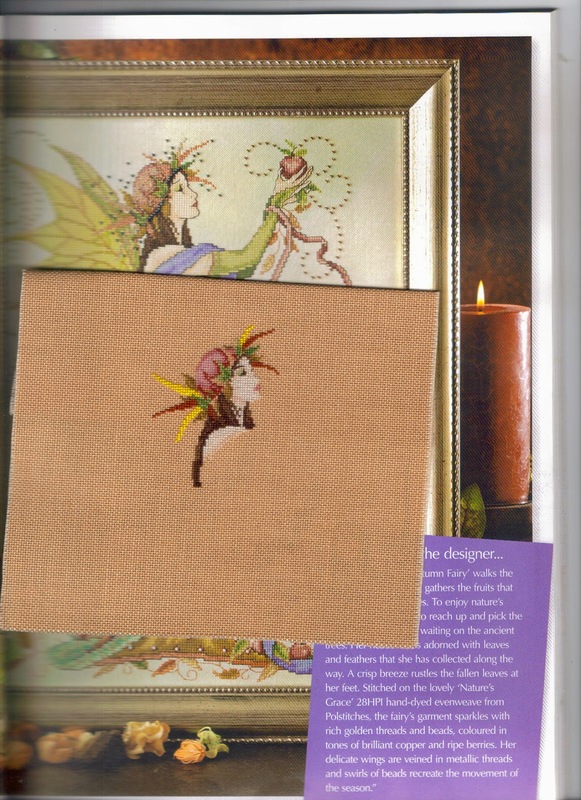 I did get the issue of Cross Stitch and Needlework magazine that has the new Nora Corbett mermaid in it. I rather liked the magazine, there was a wide range of designs in it. Some not to my taste but quite a few that I did like. 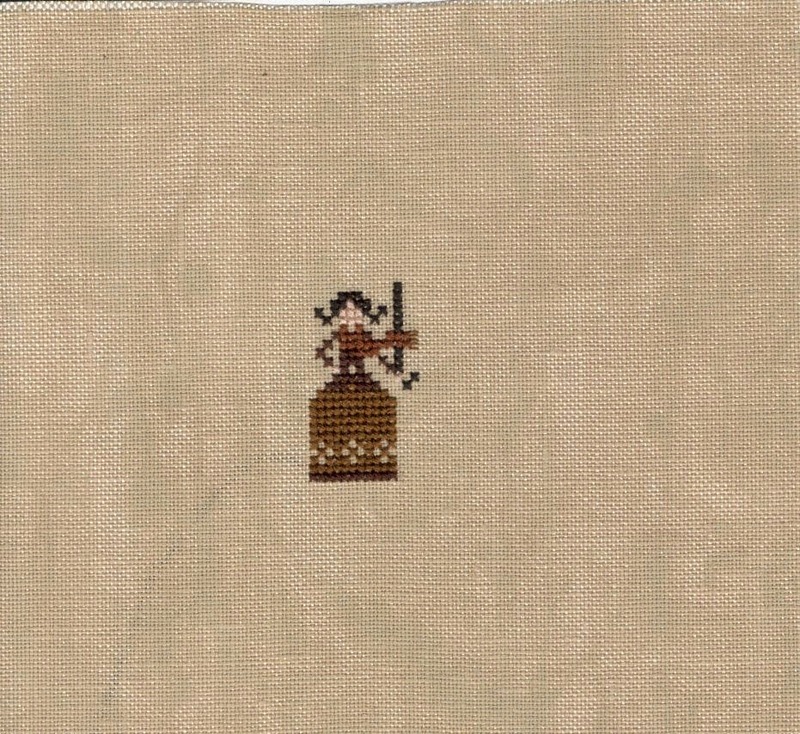 I might look into subscribing to this one instead of the UK Cross Stitch Collection. 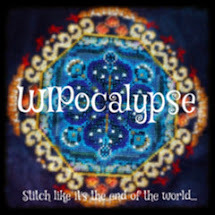 The other three can all be seen in my WIPocalypse post and I have not stitched on them since. 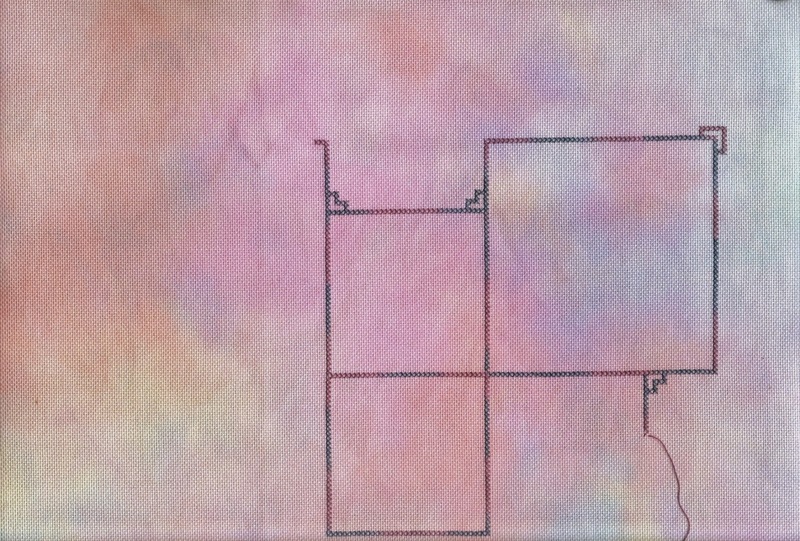 I don't want to add anything else to this block until I see the rest of the squares. I will probably add my initials and the date in here at the end. I also took part in a mini-challenge this week on Facebook. I recently became a big fan of the Paper Panda, who makes the most lovely paper cut artwork. She posted this image on her FB page with the challenge "These are tiny mice made from paper that's been cut with my own fair paw with a scalpel. I invite all my lovely fellow artists and crafters to post a photo of a miniature mouse made from the medium that you usually work in, so crochet, paper, paint, buttons, wood, chewing gum - anything! How small can you go?? It must be recognisable as a mouse and as teeny tiny as you can possibly make it with your own fair hands." Except I guess you have Euros now and I don't have any of those. I did have some Pfennigs and Drachma but I don't think I have any German or Greek followers. Finally, I will be sending the first Summer Postcard out this weekend so keep your eyes open for it appearing on a blog somewhere near you. It is not too late to enter this Blog Hop, just click on the nice garden photo at the top right of the side bar for more details. 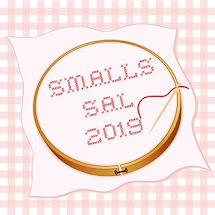 At the beginning of the year, like many other bloggers, I make plans for which projects I will stitch in the coming year. I always start off well, staying on target, the WIPocalypse helps with this. Then as the year progresses, things crop up, Weddings, Babies and of course, the SAL. Now there are two types of SAL (Stitch a long for the newbies). 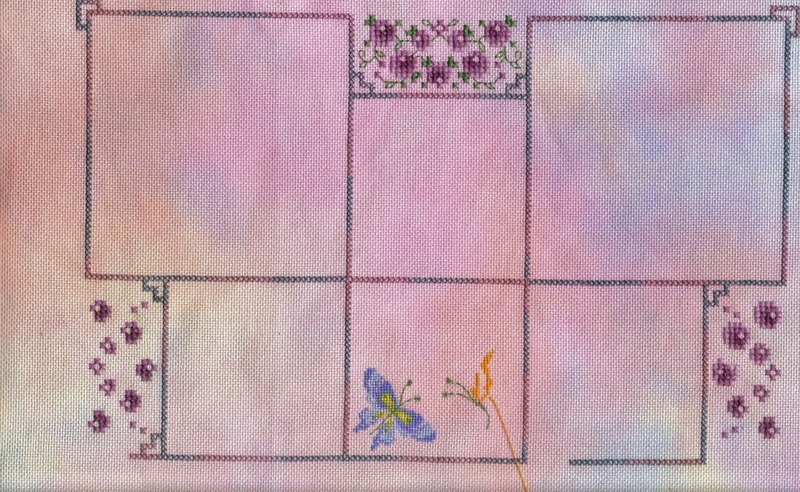 The first is where two or more people decide to stitch the same design together. 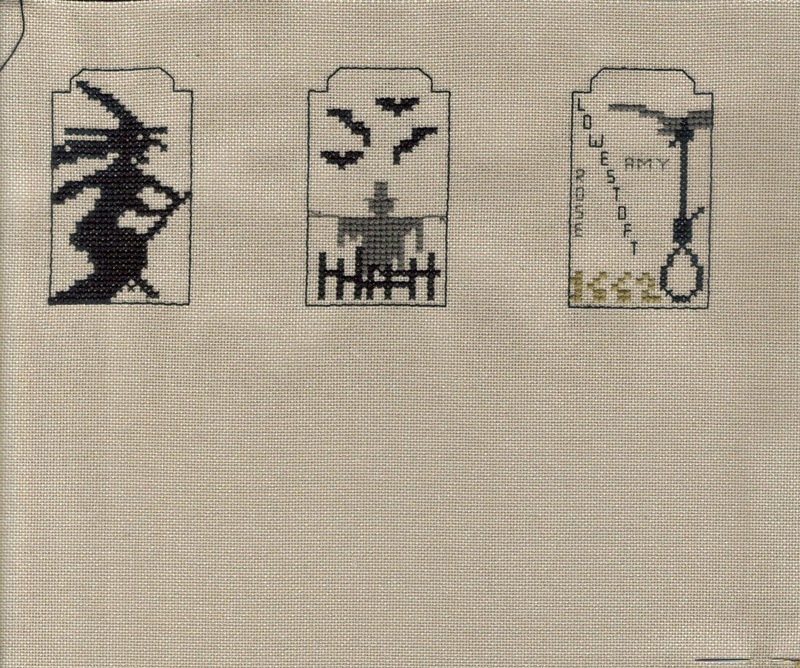 Like The Spooky Countdown which Giovanna and I are both stitching. It is easy to say Yes or No to one of these, you already have the design and it fits into your schedule. Or people suggest it and you think "No, not really me, I'll pass on this one". Then there is the second type - The Mystery SAL. Cue Scooby Doo music. You know the designer, you like the designer, you like the subject matter from the title. But you don't know what the design will be like. And everyone is getting excited about it. And excitement is contagious. And you know you won't catch up if you start later, and what if it is discontinued and you kick yourself for evermore for missing out. And all the other girls are doing it, Mum, I'll be the only one not, what will we talk about at school now? There are three more boxes to be stitched at the bottom. I have got bored stitching those fiddly flowers in the side panels so moved onto the centre. 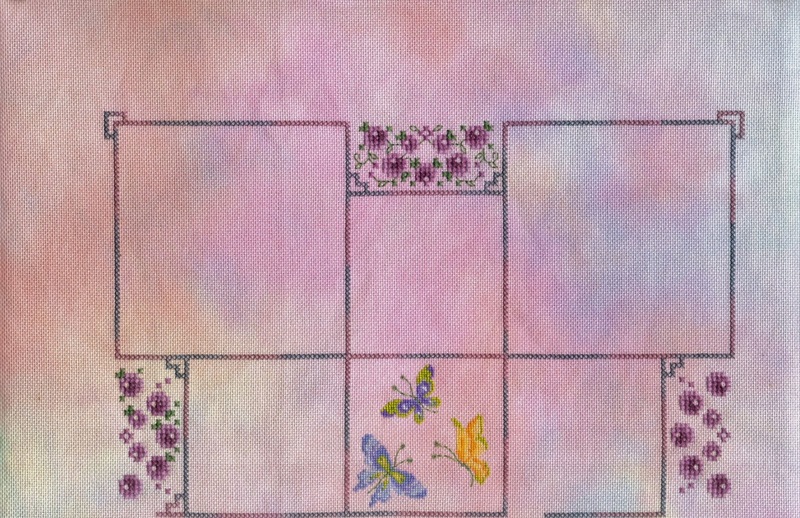 The centre box has been charted with a title and more flowers but I wanted something different so I chose some of Joan's butterflies from the Butterfly Fairy chart. They are an absolute pleasure to stitch and look lovely too. The fabric is a piece of Jazlyn evenweave from the Crafty Kitten called Snapdragon. So I figured that I could fit this in OK with all my other stitching committments as long as I didn't take on any other projects. I'm only doing the one Round Robin this year so this kind of takes its place. So I'm feeling quite smug as I resist not one, but two Hallowe'en Mystery SALs. Even though Hallowe'en is my favourite and my best (as Lola would say). And then I get an email entitled "A Gift from Sharon", that darned woman has signed me up for another Mystery SAL! This is a lovely calendar called Light & Landscape by a photographer named Fran Halsall. This page shows Scott's View in the Scottish borders and the caption says "named after the famous author, look across a tight bend in the River Tweed to the Eildon Hills, under which there is said to be a doorway to the kingdom of an Elvish Queen." So maybe my Autumn Fairy is really an Elvish Queen? She does look rather regal. 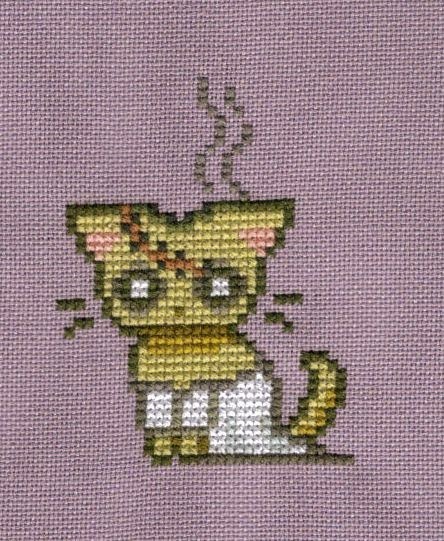 BTW I decided to go with stitching over 2 with an option for over 1 on the skin for the whole project. In case you were wondering. Finally, don't forget the Summer Postcard Blog Hop. This year's theme is Gardens, click on the picture of the garden to the top right of the blog for more details. I have received a few pictures so far and I think I will start sending them round to people very soon! 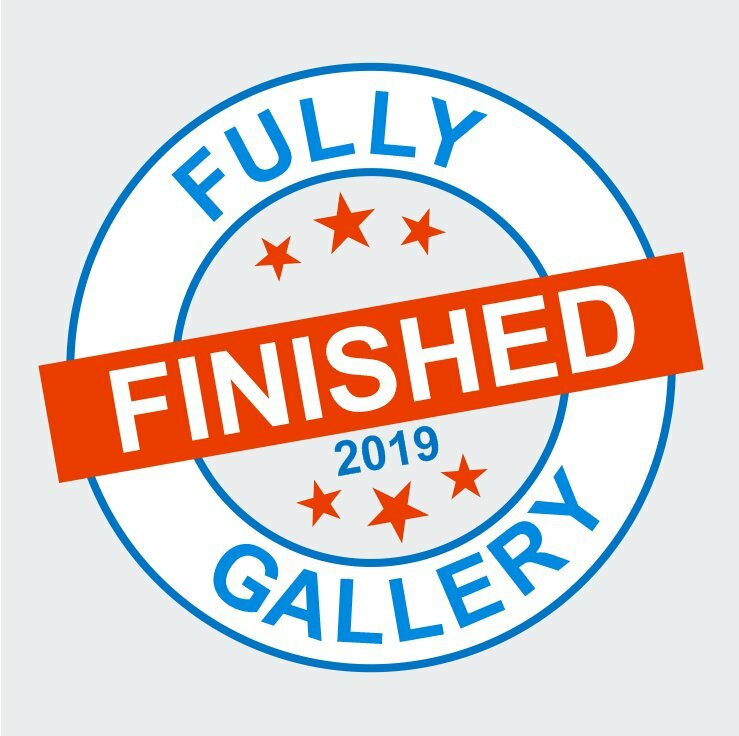 If you have already signed up then send me your photo as soon as it's done. If you haven't signed up then what are you waiting for? Get clicking! 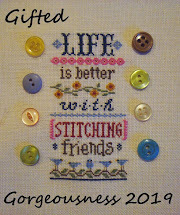 Have you ever been to a stitch gathering such as a retreat or a festival? If so, tell us about it! I have been on two quite different gatherings. The first was a Re-Treat with the emphasis on the treat. Two sisters owned a converted barn where they held the retreats for only 6 other ladies at a time. One sister taught the stitching and the other sister did the cooking and also the pampering in the evenings. I had a wonderful time! We spent three days just stitching, chatting, eating, having our nails done and shopping in the pop-up shop they had there. There are a number of get-togethers I would like to attend, the Mira Minions have one organised for next year already and Dawn from Crafty Kitten is also organising one for her 5th birthday (the company's, not her's!). The ladies from Needlecraft Haven also get together regularly and it would be great to get to either Ally Pally or Harrogate for the shows there one day. I used to love going to the big show in Olympia too. Maybe I should organise my own retreat so you could all come to me!! Finally, since the demise of the Google Reader I have been using Feedly which I really like. Until this week when it has been cyber-attacked! It's called a Denial of Service attack and the baddies flood a website so it crashes and then demand a ransom to leave. Each time Feedly fixes it they get attacked again and off it goes. I could read blogs via my Dashboard but when Feedly comes back they will show as unread and I'll have to mark them all off again! Oh, the problems of the First World. So if you miss my comments now you know why. No, not a reference to my petite derriere, but the fact that the combination of frogs and a new SAL have made me fall behind on my self-imposed schedule for Spooky Countdown! The plan was to stitch one block per weekend. 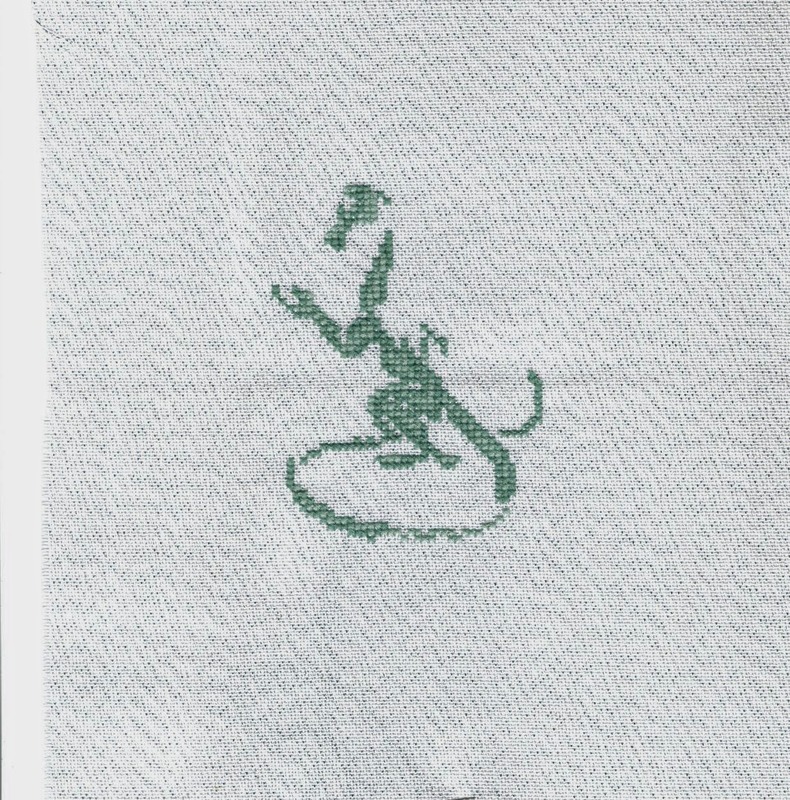 But last weekend I dedicated to frog-slaying and re-stitching Noel Blanc so I only managed half a block and then this weekend I became obsessed with the new Joan Elliott SAL on FB so I completed Block 18 and managed 3 lines on Block 19. To be fair, there is quite alot of dense stitching in those pumpkins. And Block 19 looks like nothing at all! Remember last post where I was debating with myself about stitching it over 1 or over 2? I finally decided on over 2 but with the option to stitch the faces over 1 as suggested by someone on FB. This proves my point about asking for advice online - if you have two equally valid choices you cannot decide between, you can guarantee that someone will come up with a third equally valid choice just to confuse you! Or in this case, help you out! The fabric is a piece of Crafty Kitten Jazlyn called Snapdragon. Thank you to everyone for your commiserations on the frogs over the last two posts, it's worth re-visiting the previous post to this one to read Christine's and Julie's in particular as they both made me giggle! Finally, don't forget the Summer Postcard Blog Hop. This year's theme is Gardens, click on the picture of the garden to the top right of the blog for more details. I have received a few pictures so far and once I get to six I will start sending them round to people. All Frogs Have Been Banished from the Kingdom! 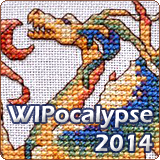 See, I have completely finished the bad border and reached the far end of it too. Now I have to stitch the outer border and then I can reward myself with the lovely alphabet. The frogging was a pain but it was worth doing because there was no easy way to fudge this as it is a double border, it just threw the outer border and the symmetry totally off kilter. Usually at the beginning of a month I start with my obligation stitching and my monthly challenges to make a good start. This month I have signed up for a Joan Elliott SAL on FB. The border was released this week and there will be eight further parts over the next eight months. The layout is very much like a round robin with four larger blocks and four smaller blocks, there will be eight faces to go in the blocks. As usual there has been lots of chat about fabrics and colour schemes etc. Many of Joan's fans are English because she regularly features in the UK magazines and like many English stitchers some of them are surprisingly inexperienced with evenweave and higher counts. I find the English obsession with 14 count aida hard to fathom!! I do appreciate the ease with which you can stitch on it, the fact it is clear to see the holes and easy to count spacing out. But compared to the feel and look of evenweave - no contest!! Personally I blame the magazines, they rarely feature anything other than plain aida and considering we have three* of the finest hand-dyers in England this seems strange to me. Anyway I am hoping this SAL will open up the beautiful world of hand-dyed fabrics of all counts to my countrywomen. Which brings me on to my dilemma. 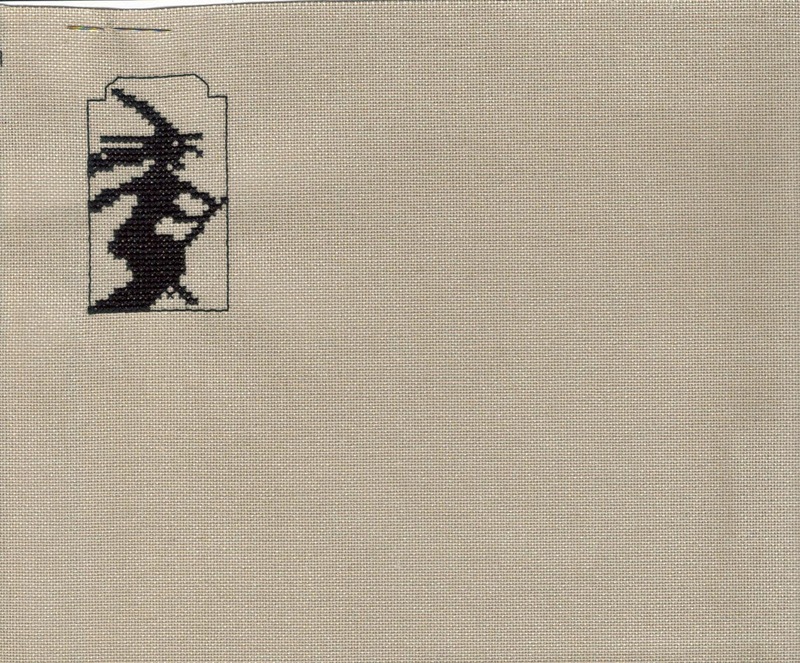 The stitch count is 139 x 139 so 10 inches on 28 count. I looked in my stash bag and found some nice 28 count Crafty Kitten hand-dyed and started stitching the border. While thinking "this is big, it's not 32, is it going to look too chunky?" I don't have any suitable 32, most of it is either bright solid colours or neutral linens for samplers. Then I thought "what about over 1?" I checked with Sharon Shebafudge to see what she thought, she damned me to hell and back because she has a lovely piece of fabric which the SAL will fit on over 1 and now she can't shake the idea! I had to change the metallics to plain DMC, I rather like the bright yellow and there's an orange to come. The beads will be French Knots. 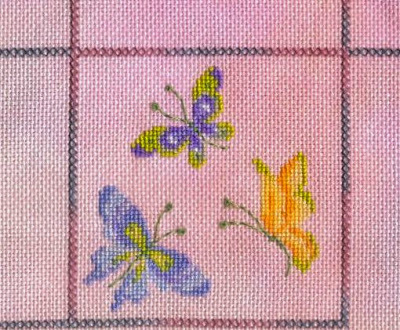 The only issue now is the backstitch, the charted colour is way too heavy so I'm thinking of using a sewing cotton instead in paler colour. Most of the design doesn't need bs anyway, just the outline of her face. * wondering who the three are?